In 1956, President Eisenhower initiated a new program called Sister City International or the People-to-People Program. The purpose of this program was to promote cultural and economic exchange between the US and other countries by establishing relationships between cities of similar size and economic base. 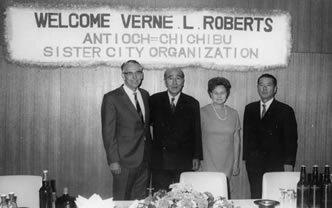 In the mid 1960’s Verne and Emogene Roberts of Antioch traveled with the League of California Cities to six countries to investigate the possibility of establishing a Sister City relationship. Although the city of Chichibu was not one of the cities visited, the last ten days were in Japan. After returning, the Roberts explained to interested citizens of Antioch how we could have a Sister City in a foreign country. An informal committee was formed to discuss the possibilities and advantages. Members of this committee included Reverend Allen Lewis, Walt Rienke, Betty Flaherty, Sally Massey, Roy Murphy, Iver Kipp and Verne Roberts. At the same time in Japan, Chichibu City was seeking a sister city in California. The two cities were likely candidates to be each other’s sister city as each city had manufacturing plants, were situated near a river, had a mountain in the vicinity, and were at the edge of the economic sphere of a large metropolitan area (San Francisco and Tokyo). The Sister City relationship between Chichibu Japan and Antioch California was proposed by the Sister City International Organization based on the similarities between cities and the desire on the part of each to establish a Sister City in each other’s country. This proposal was approved by the sister city organizations in each city, and after many letters back and forth between cities, an agreement was reached and approved by the Sister City International Organization in Washington, D.C. 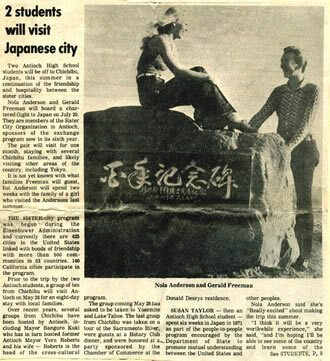 In 1967, the Antioch City Council approved a resolution accepting Chichibu as our sister city. In December, 1969 The Roberts’ went to Chichibu to formally initiate our now longstanding relationship (see photo). They were greeted by Mayor Bunjuro Kuki and the 45 members of their City Council as the first Sister City delegation from Antioch. Antioch started the first exchange in 1971 when David and Sally Massey chaperoned students Nola Anderson and Jerry Freeman (see photo) to Chichibu for one month. 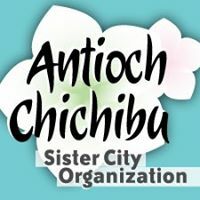 WIth the exception of the summer of 2011 when Japan was recovering from the earthquake and tsunami, the Sister City Organizations have sent a delegation from Antioch to Chichibu, or from Chichibu to Antioch, every year.